Wow! I cannot believe I am actually writing this post. 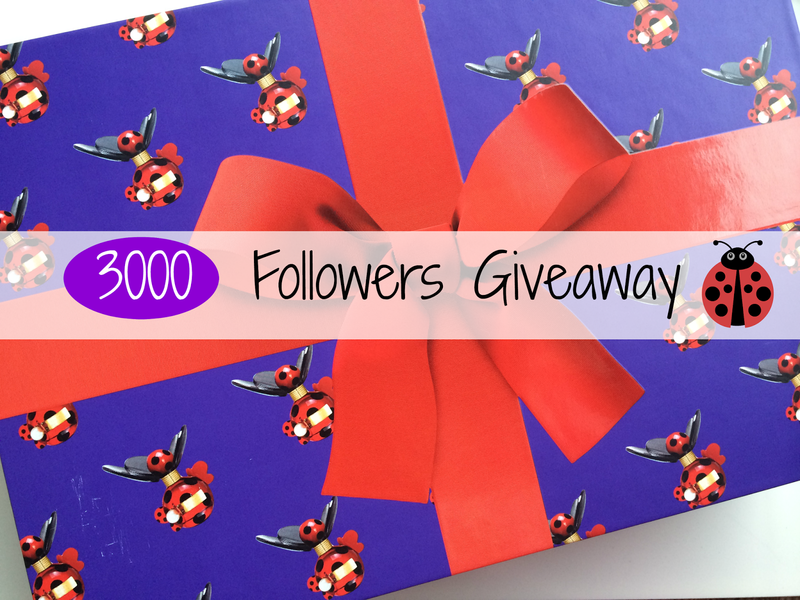 I've hit 3000 followers on bloglovin - three thousand. That is insaneeee, I literally cannot believe it! I am grinning from ear to ear and feeling a little bit proud I tell ya! It has been less than a year since I reached 1000 followers, so to be at 3000 already is overwhelming! When I started this little hobby of mine up I could have never imagined how much fun it would be and how much I would learn and achieve, it's been an amazing 20 months so far! Blogging has transformed into a major passion of mine and I have loved watching this random little website grow and involve into something that people actually want to follow! So.... I thought it was only right of me to hold a cheeky little giveaway for you lovely lot! I am giving away a Marc Jacobs Dot 50ml Gift Set. A gorgeous perfume in a gorgeous bottle ... I kind of wish I was keeping it for myself to be totally honest! This set includes the 50ml Eau de Parfum, a body lotion and a shower gel. NOTE : I really, really would love for this prize to go to one of my readers/a fellow blogger/a beauty lover - so if you have just stumbled across this site and are just going to enter for the sake of it then I please urge you not - as at the end of the day whoever wins is out of my hands and I would love to be able to give back to someone who has supported me! All you need to do to enter is fill in the snazzy Rafflecopter below! Congrats hun! Here's the next 3000! I have been following your blog and watching your YouTube channel for a long while now, you are one of my inspirations and I feel very proud of you too! (Is that weird??).. But well done lovely, you deserve it! Heres to the next 3000! My goal is to get my black belt in Ju Jitsu this year! My #1 goal is to become more focused on everything I'm doing. Oh my god congratulations, that's insane! You were one of my inspirations when I first started blogging! My goal is to get healthier and post more on my blog! My goal for 2015 is to finally save enough money to go and visit my family in Aus. Ive not seen my cousins since they were 4 and they are almost teenagers now! My 2015 goal is to get my blog up and running properly for 3 years I have been wanting to do it and keep deleting due to confidence. Well done on 3000 I remember you starting and being so happy you was finally blogging after following you on twitter. Congratulations onreaching 3000 followers. Your blog is amazing. One of my goals for 2015 is read more, I love reading but never make enough time for it. To get 100 blog followers! Congrats on 3000! I just hit 2000 so I know how you feel! So my goal would be to hopefully reach 3000, haha. I'm graduating this year and my goal is to get a job (hopefully in publishing)! :) Congratulations on 3000! My goal is to learn cooking perfectly & loose some weight hopefully! I'm mainly aiming to be more positive and trying to see the best in everything. It's made me much happier so far! Congrats on 3000 followers!! My goal this year is to be more organized and timely. Thanks for the giveaway! Huge Congrats Lovelie!! My goal for the year is to get to 1000 BL followers... Fingers crossed! Wow! Big congratulations lovely! I've been following your blog for quite some time now, and you put so much thought and effort in to every post, you 100% deserve it! My goal for 2015 is to maintain my current weight, I lost just over four stone last year and I worked so hard to shift it, that I am determined to keep going forward and keep that weight off! Congratulations on hitting the big 3000! How incredible! One of my goals for 2015 is to read 21 books! My goal is to laugh every day. Battista, who heads a 40-person creative team, said America already had a feel for rural Texas football, Timberland outlet nederland which was popularized in the "Friday Night Lights" book, movie and TV show. The Lewis-narrated ad was intended partly to depict the reality that many urban high schools lack football fields and players must "commute" to practice. "This was inspired by being in the city," goedkope timberlands schoenen Battista said. The ads' local connections are not always so easy to spot. I'd love to reach 1000 bloglovin followers! To set aside more time for my blog. My goal is to clean my room like everyday and be a bit more fitter! My goal is to not procrastinate anything this year and to just sit down and do it so I don't have to worry over it all day. To stop smoking it's so bad for me ! My goal is to relax more and have more me time which has taken a back seat. To sort out my make up drawer. In 2015 I really want to learn to drive, and improve my blog as much as I can its the first thing I've stuck with for a long time! My goals are to try and believe in myself more and to stop comparing myself to others! My goal is to pass my maths course! Boring, but useful. One of my goals for this year is to get up a bit earlier so that I can pretty myself up a little bit more. i like to read subscription boxes reviews and different gift guides! my goal is to eat healthier nad drink more greens! My goal is definitely to pass my driving test! My goal is to try and find a little bit of time each week for me. The last few years me time has been seriously lacking! My goal is to organise my life! This is very useful blog achieve the life is the best moment! goal of life thanks for sharing. safety diploma courses in chennai|Industrial safety training institute in chennai |diploma in fire and safety courses in chennai|iosh managing safely course in chennai|nebosh courses in Tamil nadukeep posting. Its goal of the standard post thanks for sharing!! Safety Officer Course offers the fire safety , Safety brings first aid to the uninjured. to develop a safe person . useful and nice info about workplace safety.